The FINRA Series 53 MSRB Municipal Securities Principal Qualification Exam requires a high standard of knowledge and competency. "The Solomon Exam Prep Guide to the Series 53" will help you tackle the Series 53 exam by focusing on the most important and difficult concepts of the exam. 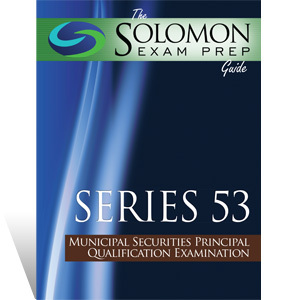 "The Solomon Exam Prep Guide to the Series 53" includes practice questions and answers after each chapter, information about the exam, and helpful study tips. I passed the Series 79 (on my first attempt) with help from Solomon Exam Prep. I found the study book and online exams to be quite helpful, and would recommend Solomon as a study resource for anyone.